Imagine yourself in a situation where you want to put up a website. Now, this isn’t a big commercial site, it’s a small one dedicated to your club, or it’s your personal blog or just something you’ll hone your coding skills on. Because of all this, you really aren’t looking to spend any more than you absolutely need to. 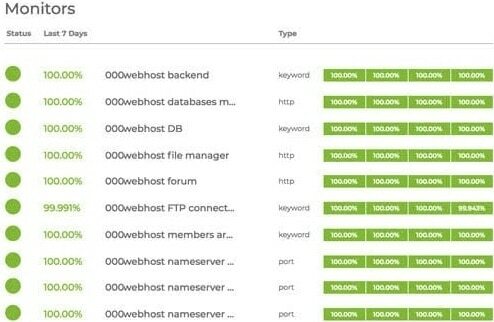 Most of the time hosting is something you would need to pay for, but with 000webhost you’ll be able to get everything you need for free, leaving you to focus your finances in different directions. If you’ve had any contact with building sites and/or hosting chances are, you’ve probably already heard of 000webhost. They’ve been around quite a while (over 10 years in fact) and their defining feature has always been providing a free hosting option. We’ll go through everything you’ll be able to get for this lowest of prices just so you can see how good of a deal this is. Before you can do anything, you’ll have to sign up. Once that is done and you’re a member, you’ll get to download and install whatever system you’re going to use for building your website. Everything is automated and you don’t have to worry about running into trouble. WordPress is by far the most used CMS around and you’ll be happy to know that it’s supported in this instance. Without getting into too many details (we could be lost for pages upon pages), it’s easier to mention that, with all its plugins, apps and tools it’s the ultimate platform for both newcomers and experienced users. It even comes with the UnderConstructionPage preinstalled, so you can relax while working on the new website knowing your visitors are taken care of. If by any chance, you don’t prefer WordPress you’ll be given the option to use Free Website Builder provided by Zyro. It’s a nice visual editor you’ll use right in the browser just like any other. It has an extensive template base. Any of the templates can be further customized with many different options characteristic to web pages, like videos, social media plugins, galleries etc. If you by any chance feel like the templates just aren’t working for you, you’ll always have the option to build a page from scratch. WordPress is the most prominent of the bunch and Free Website Builder is an in-house brand, but you’ll get to use many other CMS platforms like Drupal, Joomla and over 50 more open source options – again all available for automatic install in just a few moments. Whichever one you go with, it’s a given that the more you know, the more you’ll get out of it. All the best website editors are powerful tools that, in kind, need powerful support to keep them running optimally. They’re like a fresh coat of paint; it looks great but if you don’t have a good engine you won’t get much out of it. So guess what – it’s time to look under the hood. You’ll be using the Cpanel control panel to run your site, which is pretty rare for a free service. For those who maybe don’t know, Cpanel is a control panel for hosting and admins. It basically helps you run your site from that aspect much easier since it has a simple visual interface making it appropriate for new users who won’t be frightened by the prospect of having to know how to code. The service supports PHP and MySQL, among others, which is nowadays absolutely essential. You’ll be able to use two MySQL databases, which for a free service is more than enough. Speaking of impressive things for a free service, the uptime on 000webhost is a whopping 99,9%. This number is proven and can be monitored and just goes to show you the strength of their servers. The space on those servers is also a hefty number that caps at 1000 MB of disk space and 10 GB of bandwidth, again great numbers for the type of sites the service is primarily meant for. You’ll have to fill all that disk space with something and you’ll be able to manage all that content with an integrated manager or any FTP client. Last but certainly not least is security. A good site, no matter how big, has to be able to protect its information as well as the information of its users. That’s why your site will be protected with an SSL certificate. The benefits of this are two-fold – apart from the protection your site will also fare better in search engines. But if you decide to go with WordPress, we suggest installing Security Ninja right away to make sure your site is always protected. 000webhost has a specific kind of support service. There isn’t a dedicated customer service; instead there is a support forum where the entire community chips in with helpful advice. Of course, there are numerous moderators who work intensely on solving issues, but you’ll be surprised how many times members of the community will be able to help you out. If problems do arise you shouldn’t fret. Backups are done automatically on a monthly basis, but you can also do them manually so your content is even safer. When you get a habit of doing regular backups this really won’t pose a big problem. Most of the time when people think of a “free service” they generally think of a light or trial version of much more advanced products. With 000webhost this isn’t the case. From the beginning (and going on for over a decade) it’s been running as a free service and over time the number of features has only grown. Granted, according to its limitations, but still grown in every aspect. All of this points to a healthy developmental cycle that is aware of the limitations of the “free” tag but keeps improving within its means nonetheless. This is why it’s also important to be realistic and realize for who this is meant for. Knowing that a big commercial site simply can’t run on a service like this simply has to be accepted, but there’s also a plethora of instances where it’s more than enough. Looking at all you’re getting and what you’re paying for it, we can safely say that you’ll be getting much more than you pay for. Because of everything mentioned we’re happy to recommend 000webhost to anyone who finds themselves in need of a free hosting service.